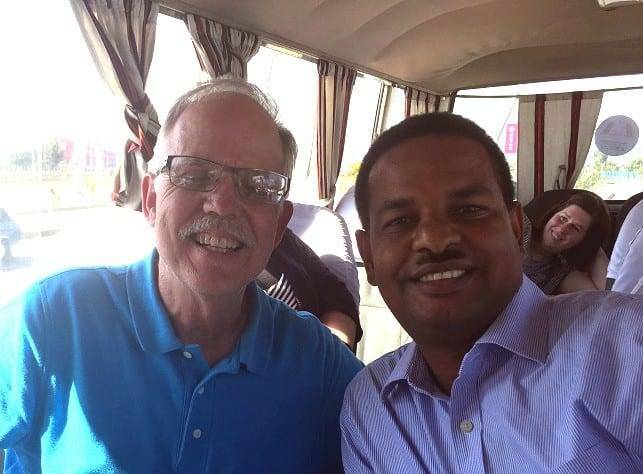 Bill Goodson (left) pictured with Girma Gebremedhin (right), the only Ethiopian Awana missionary in the whole country. He has trained and started over 300 Awana programs across the country. The team visited with students at the local school and led them in games and songs and helped families whose children are supported through the Children’s Hope Chest. A group of West Unity residents took a long journey with the goal of linking with another community half a world away. Under the auspices of Children’s Hope Chest, the nine-person team traveled to Ethiopia on a “Vision Trip” Jan. 11-15. The team was led by Wendy Walz, who along with husband Derek, have been leading trips to Ethiopia for several years. The couple has adopted four Ethiopian children to go along with their two other children. Bill Goodson, who runs 4-H Camp Palmer near Fayette, was also part of the team. Uganda, Ethiopia, Guatemala and Swaziland. Most of the mission team were worshipers at Solid Rock Community Church of West Unity. One hailed from Fort Wayne. The trip was ostensibly made to provide support for a school Children’s Hope Chest runs in Tullo, Ethiopia. The school has about 210 students, about half of which are sponsored through CHC. The Walzes coordinate the school. Children are sponsored for $38 a month, which helps provide fees, supplies and one meal a day. The need for support is acute. Ethiopia is a “young” nation where 41 percent of its 86.6 million people are 14 or younger. Only 3.3 percent are aged 65 or older. The mission team ran a three-day Vacation Bible School through the Awana ministry. The team brought backpacks for every student filled with notebooks, textbooks and toiletries. The team worked with local representatives of Children’s Hope Chest and Awana. The team told stories and did crafts with the schoolchildren. 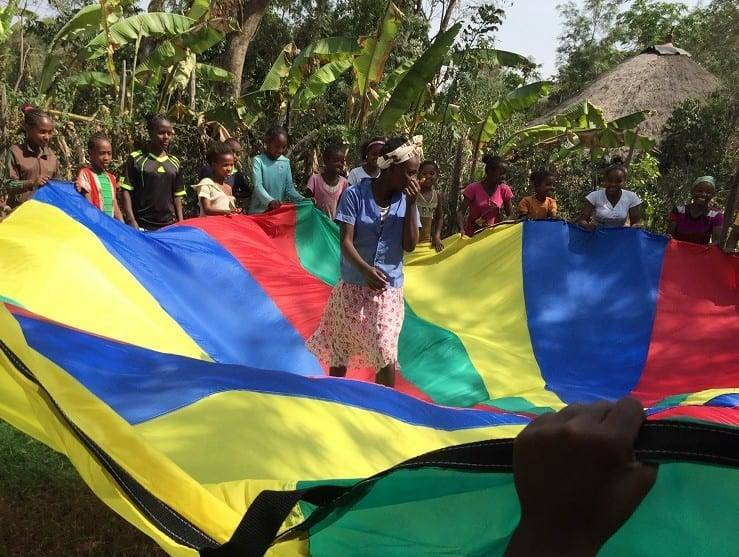 The team helped run Awana games outside as the visit occurred during the dry season. One the last day of the trip, the team handed out the backpacks to all the students, Goodson said. “We had a feast,” Goodson said. The children enjoyed bottles of pop, a rare treat for the children, he said. The people in the village live in grass huts, they have no electricity or running water. While the Ethiopians drank from the wells, the Americans were limited to bottled water. A family of eight lived in one small hut. They sold milk from their cow to earn money. The team visited another family, a widow with three children, one of whom is supported through CHC. The differences were stark for the visitors who stayed in a modern hotel and ate European dishes. Despite the abject poverty of the villagers, the mission team noticed something. “We never saw such great need, but we saw people of great joy and happiness. They had made peace with God,” Goodson said. One day, they brought the widow into town and bought her three 50-lb bags of maize and clothing for the children. “We hired a donkey to bring the food back to the village,” Goodson said. Donkeys are used for just about everything when powered transportation is needed. A car is a luxury Ethiopians don’t even dream about. Wherever the bus the mission team hired went, they were met by large crowds who would wave at them. The team made several friends on the trip, fulfilling a goal of the Children’s Hope Chest: Getting communities in the United States to support another community in a different part of the world. The mission seeks to have sponsorships for all 212 students at which point the school will get its own well. From there, a business will be started to help make the school self-supporting. The teams also help with shoes for the students, many of whom walk two to three miles barefoot. “It gives people hope,” Goodson said. “Hope through God. With that in mind, the ministry needs 70 more sponsors for the school. The hope is to raise it from the local community and take the new aid over next January. Anyone wishing to go next year should plan on setting aside $1,500 to $1,700 for airfare alone. Lodging, food, staffing and bus rentals will add another $900. Spending money is on top of that. Everyone needs a valid passport. Goodson learned that it doesn’t matter how much money one has or if they live in a grass hut or not, if they have peace with God, they can still have hope and joy. Goodson said returning he saw what a blessed life he has to work and love in northwest Ohio, with all the modern conveniences people take for granted. But despite all these conveniences, Goodson believes Americans have more stress in their lives. Be the first to comment on "West Unity Church Group Visits Village In Ethiopia"